One negative feedback session – done well – has more positive impact than a hundred pats on the back. Seek input from a mentor or coach. How much of your feedback is really about making life easier for you? #2. How old is the issue? If you waited six weeks to give negative feedback, you need feedback on giving timely feedback. You’re team member hasn’t repeated the behavior for six weeks. Should you let it go? Your team member hasn’t repeated the behavior recently, but they will. 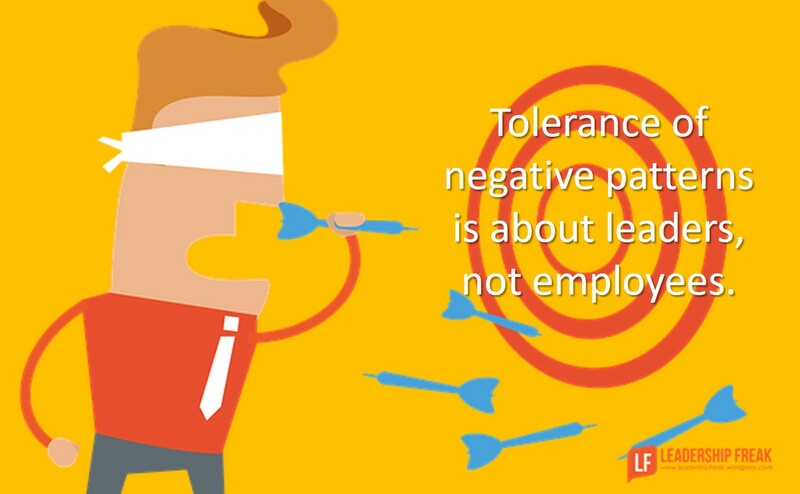 The tolerance of negative patterns is about leaders, not employees. If it’s a pattern, deal with your issues first. #3. How might negative feedback enable them to better reach the goals and commitments they have for themselves? The issue may be conflicting commitments, not negative behaviors. Don’t impose expectations that exceed commitments. The indication that your expectations collide with their commitments is you feel like you’re pushing ropes. Committed people may need direction, encouragement, challenge, development, mentoring, or coaching, but they don’t need to be pushed. #4. Do your aspirations for them, exceed their own aspirations? #5. How forward-facing is the language you plan to use? Develop a forward-facing approach with a trusted colleague or coach. #6. How often are you giving positive affirmations that stand on their own? If you’re such a strong leader, why is it difficult for you to affirm positives and easy to point out negatives. Strong leaders do tough things. For some, the tough thing is affirming positive behaviors. The required ratio of positive affirmations to negative feedback is about four positives to one negative. #7. How might their strengths connect to the behaviors you expect? How might leaders effectively prepare to give negative feedback? I will apply it in a different way and would value your comments. In your role, in my role we serve leaders of companies. Often we have to them their “baby is ugly” before we can develop a plan to correct it. I will apply this post when serving my clients and recommend others who serve companies do the same. A topic I would enjoy comments on is : Is your organization open to Heretics who identify unresolved market problems and opportunities for change in your organization? I love to give positive feed-back and usually I take my time to give the negative ones too, although I prefer to call it constructive feed-back ;-). I’m trying to address the problem as soon as I’m aware of it because I my opinion it is better to have it fresh in the head and with all the details that could be forgotten days after. I’m always prepare my encounter with the team member that need an up to date on their work commitment or behavior. I’m starting with your 1st question to explore if there’s something bothering them at the job or outside. I’m collecting information’s to seize the fundamental cause that could be the reason for the problem. From that point I’m usually addressing the problem as a continuous amelioration observation. I’m referring at their first reason why taking the job that they have now and getting them to visualise their first motivation and interest in this job. Then I’m pointing out the problem that we need to get on the right path and I finally end the encounter with highlighting up theirs strengths and their importance in the team. «The sandwich feed-back» is working for me. This is a great post. I especially like the statement, “The tolerance of negative patterns is about leaders, not employees.” Feedback is such a powerful tool, with both positive and negative consequences. “A word filthy spoken is like apples of gold in pictures of silver.” Have a great weekend. Sometimes I hate autocorrect. ” A word fitly spoken is like apples of gold in pictures of silver.” Old English, while eloquent, can wreak havoc with autocorrect.